A friend asked me 2 weeks ago if I could set up a website for him and he wanted to use a CMS-System to be able to edit the content himself. I do have experience with websites but based on HTML and I used Front Page and later on Expression Web. To find out what he was talking about, I asked Dr. Google and so I checked out various sites about CMS. MotoCMS tooked my highest attention for what they promised... So I decided to try out the demo. Since I`m full with projects I did&#039;nt plan to check the product out in a concentrated manner but after downloading and installing I just wanted to have a fast glance to get an idea about what matters me most: Userfriendly, self-explaining and freedom in what YOU want to put on your website and not be pressed into some nice looking templates... Well, now, 1 week later I refurbished my website in approx. 20 hours. Now, after this period of learning to handle the system I could do the same job within 5 hours! I&#039;m a geniuos to learn so quick? Not at all! But the smooth user interface and the nice results one get inmediately convinced me! Well, I had my troubles in little (but important) details and could&#039;nt find the answers in the F&amp;Q therefore I tried out the (allways visible) chat-button and the operator explained me everything including screenshots with the solution (!!!) within 5 Minutes... What more can a user expect? I own no a nice tool for creating a website with whatever content the client want and the best is, that it is superfast to realize! It was probably my best investment this year to purchase this tool and the fantastic templates... Thanks! Excellent product and top-rate, dedicated customer support. The design features and GUI are very well done and the design experience is very well supported. There are thousands of different websites, but I chose Spectrum due to its novelty and the large pack of features. In addition, you get a website builder that has all needed tools for seo, social media and website modernization. I did everything within 4 hours. Filled in the whole website with text and images, did some magic and puff&hellip; It&rsquo;s done! Actually, you don&rsquo;t have to be a magician... just an inspired businessman with a little portion of ambition. If you need to save your time and money, get this website! Spectrum is a very nice product for building businesses. There are lots of pages inside this template, including awesome child themes that require only minimal customization. You don&#039;t have to spend hours on sitting and editing your home page. That&#039;s why I like it! I was sceptical about this product. I have never heard about Moto CMS. Then I tried a demo and it made my day. I realized that I can be in charge of my business website and customize it like I want right in browser. First I wanted to buy another MotoCMS website, but when I saw Spectrum, I thought like &ldquo;this is it!&rdquo; I realised that it is one of the best MotoCMS templates on the current day. It has everything this company offers and even more. I love my website that I made with Spectrum. I have everything I need: cool design, simple editor, blog and SEO&hellip; Aside from my company promotion, I try myself as a blogger from time to time. Blog management is so easy with the admin panel. 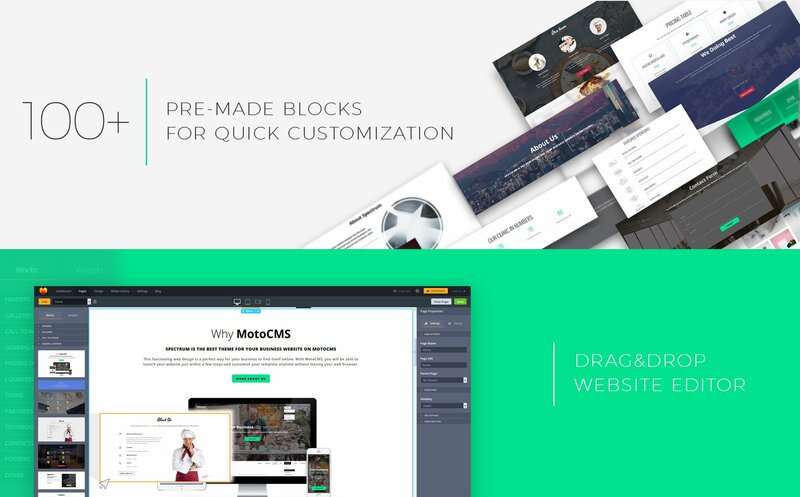 Spectrum Multipurpose Theme was updated with new content blocks for MotoCMS Website Builder. After the update, the admin panel from MotoCMS contains 100+ pre-built layout elements. We've added to Spectrum two new system pages with original design: Password Protected and Under Construction. Use the Password Protected mode to secure your template with a unique password. Activate the Under Construction mode to inform your audience when editing your website. 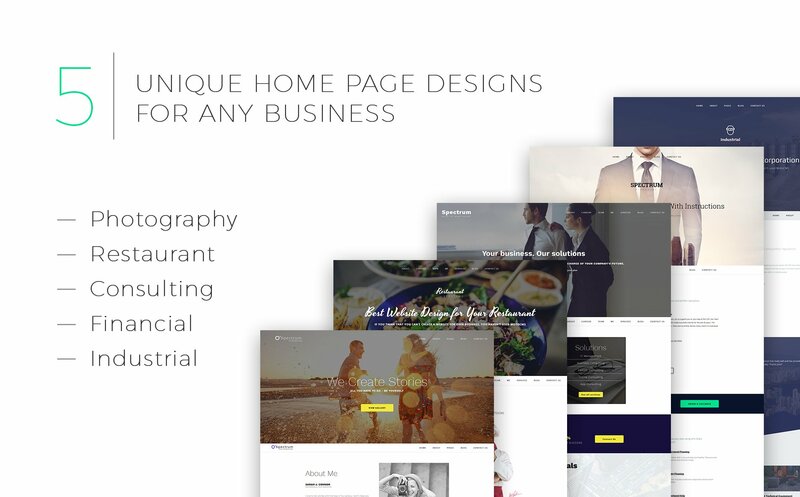 After the update Spectrum will have 6 different home pages: general, restaurant, consulting, photographer, financial and one new page - industrial. Do you know how to play with building blocks? Then building a website with Spectrum will be just an easy game for you. 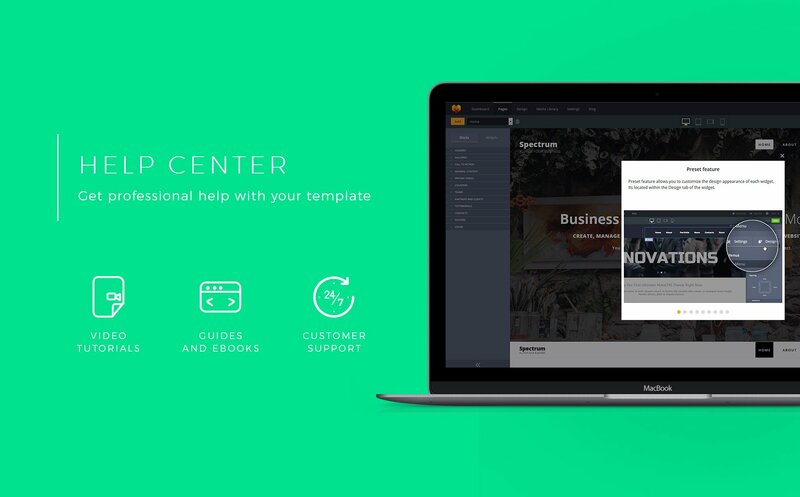 Because we've updated the most extended template from MotoCMS with block constructor. Use a wide range of made-up blocks - built-in sections filled up content to assemble your website in the simplified admin panel with more ease. Build your website home page with more than 60 blocks, including 15 General blocks, 12 Headers, 6 Footers, 4 Call to Actions, 3 Galleries etc. And wait for the completely new themes to come, made with all 5 Spectrum's home pages in near future. We've added 2 more additional home pages to Spectrum, rising its multi-functionality to a new level. 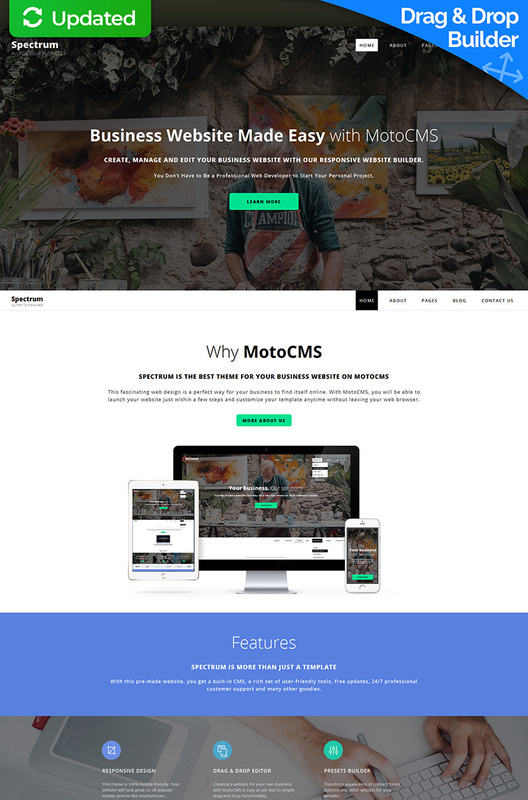 You can build any website using just one extended template from MotoCMS.